Last weekend we had a dinner with extended family, and my sister (Heather) and I were tasked with bringing a gluten-free and vegetarian main course. So we put our heads together and brainstormed delicious ideas — I’ve been craving a savoury tart, ever since getting a hold of my new favourite cookbook: Small Plates and Sweet Treats by Aran Goyoaga. Aran blogs gluten-free gorgeousness at Cannelle et Vanille, and I have been drooling over her food photos, recipes, and stories for years. I was so excited to find out she was releasing a cookbook, and have been pouring over it frequently since it arrived at my house. 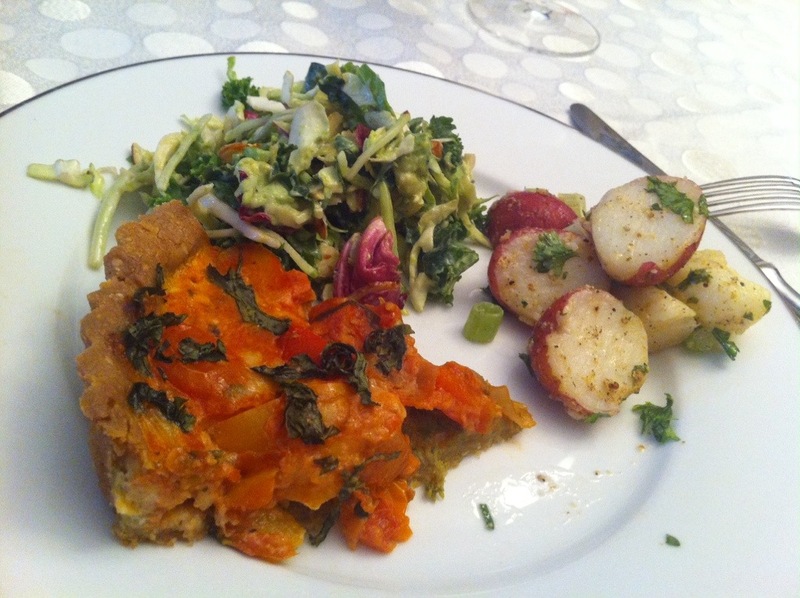 Lo and behold, she’s got a couple of savoury tart recipes — and the swiss chard, pear & gruyère tart looked tempting. I asked Heather what she thought, and we quickly morphed the idea into a savoury tart with a crust based on Aran’s tart, but with traditional pizza flavours. Tomatoes, peppers, basil, melty cheese. Done and done. Off I went to the farmer’s market with Mr. KitchenOperas to talk with our cheesemongers to get a perfect melty cheese. I was worried about finding something that both Heather and I would like. I’m a big fan of strong and stinky cheeses, and Heather likes milder options… so I asked for some cheesy advice, and ended up with the perfect choice: Gruyère. Gruyère is one of my favourite cheeses ever. I first used it in high school, when I had to make a classic French recipe for our French class. I made mini quiches, and the recipe was pretty much pastry dough + cream + eggs + Gruyère. So off I went to my local grocery store for some Gruyère, and it totally changed my life. It’s a savoury and nutty cheese (that’s just the teeniest bit stinky), that adds real flavour to baked dishes, without being overwhelming. Gruyère is made in the village of Gruyères, in Switzerland. It’s an Alpine-style cheese made with raw cow’s milk. The cheesemakers stick to tradition (as the cheese is AOC certified) and continue to create huge 80lb wheels of cheese, as it’s been made since the 17th century. It is a cooked and pressed cheese, which gives it a firm buttery-yellow paste. The rind forms naturally into a hard dark brown coating around the cheese. The Gruyère is perfect in this tart — complementing the other strong flavours: roasted tomatoes & peppers, fresh basil pesto, and a nutty crust. And Heather loved it. The only catch? There are a whole lot of steps that go into making this tart. So this is a tart for a special occasion. To make life easier, you can prepare a lot of the steps ahead of time: make the pesto and keep it in the fridge, and/or roast the veggies in a hot oven while you get other stuff done and let them cool before you even start making the tart dough. You could also make this tart crust and then fill it with any other veggies you’re craving — it’s a bit nutty from the quinoa and almond flours, and I’m definitely going to be making it again. 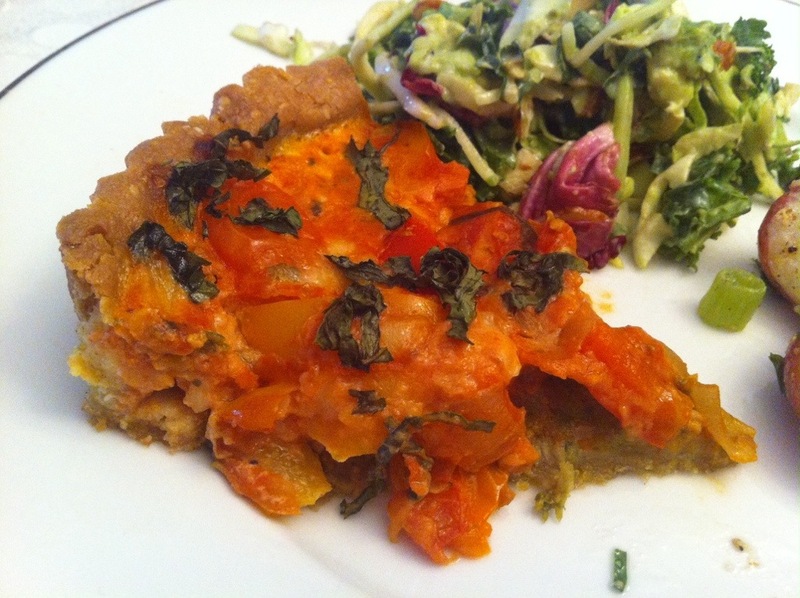 I think it’s even replaced my usual gluten-free quiche crust — it’s flaky and so good! But I promise you, this tart is divine and worth all the effort. I’m going to have to make it again soon, because I was definitely disappointed we didn’t have any leftovers to eat this week. 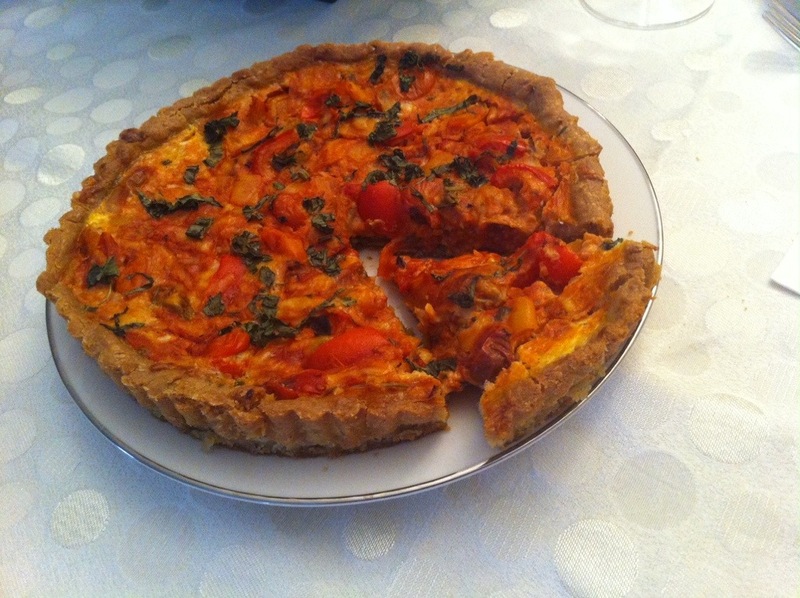 This tart is a combination of one of my first-ever favourite recipes (roasted tomatoes & peppers) that I made over and over again throughout high school. I was craving the vivid Mediterranean flavours, so I combined the roasted veggies with pesto to make a killer veggie tart that even omnivores go mad for. Makes one 9″ (23 cm) tart; serves 6-8 along with a salad. Begin by making the Gluten-Free Tart Dough: In a food processor fitted with the dough blade, combine the flours (sorghum, quinoa, almond, and arrowroot) along with the salt, and blitz for 10 seconds to combine. Add the cold butter, and pulse until you get pea-sized balls. Sprinkle the iced water over the surface of the flour/butter mixture, and then blitz until you have a ball of dough. After the disc of dough has chilled for 30 minutes, place it on flour-dusted countertop and roll out into a round bigger than your tart pan. Place the dough into a greased tart pan, and press into place. Cover with plastic wrap, and refrigerate for another 15 minutes. Remove the chilled tart dough from the fridge and cover the bottom surface with a sheet of parchment paper. Top with dried beans or pie weights, to weigh down the bottom of the tart. Blind bake the tart at 375F for 20 minutes, then remove the weights and bake for another 15 minutes. Let the tart crust cool while you prepare the filling. Now prepare the Roasted Tomato & Pepper Filling: Preheat the oven to 400F. In a large baking dish, combine the pepper, tomatoes, onion, garlic, tomato paste, olive oil, and herbes de Provence. 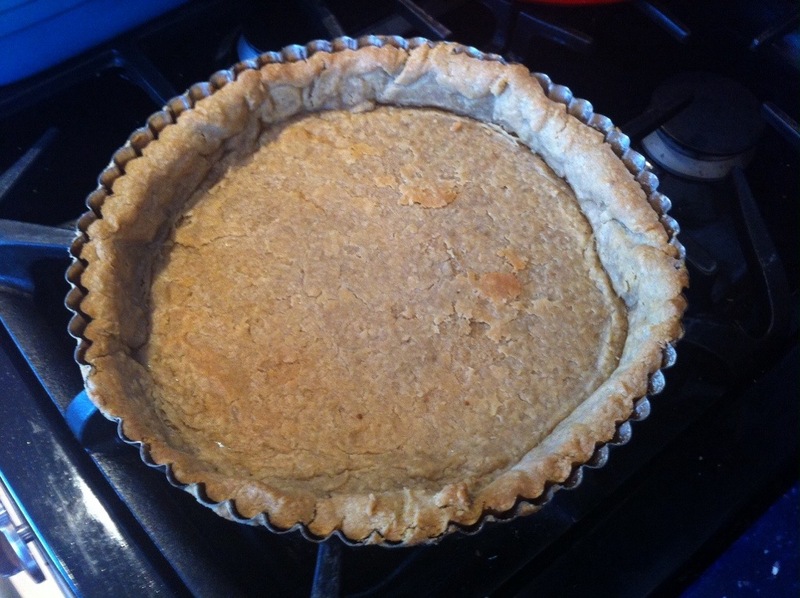 Cover with a lid or aluminum foil and bake at 400F for 40 minutes, while the tart crust cools. While the veggies are roasting, make the Nut-Free Basil Pesto: Add the basil, Romano, lemon juice, olive oil & salt to a food processor, and blitz until you have a smooth paste. You may need to scrape down the sides to get it all the same texture. Once the veggies are done roasting, you can assemble the tart: Preheat the oven to 375F and place your tart pan on a baking sheet (to catch any drips). Spread a thick layer of Nut-Free Basil Pesto over the bottom of the tart crust. 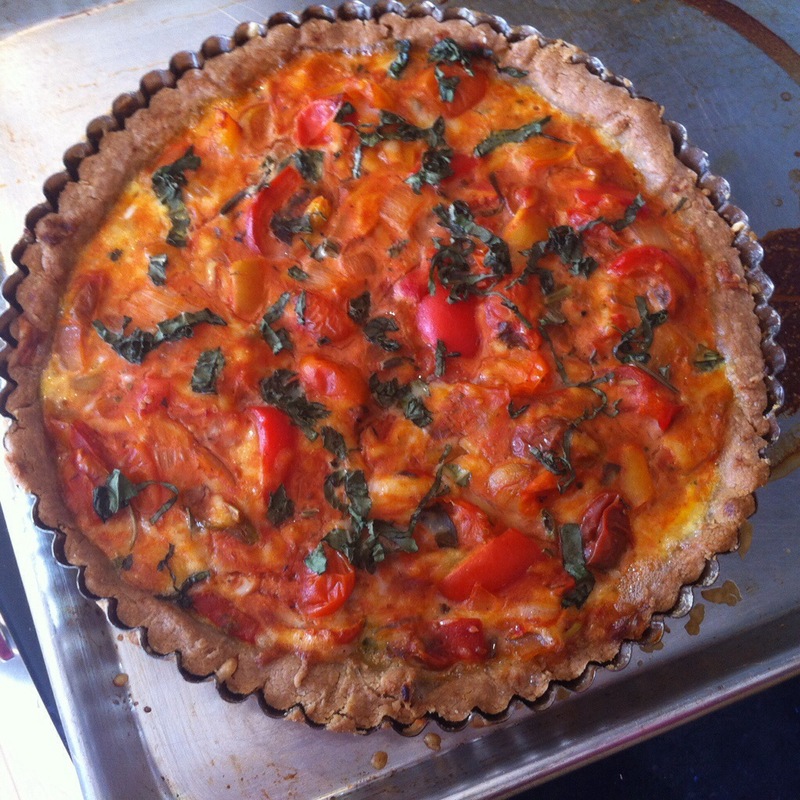 Fill the tart with the roasted tomatoes & peppers, and top with the Gruyère cheese. In a small bowl, whisk together the eggs, sweet rice flour, and milk. Pour this eggy mixture over the veggies in the tart. Sprinkle the sliced basil over the top, and bake at 375F for 30 minutes, or until the eggs are set and a toothpick inserted into the centre comes out clean. This I’ve hot to make! Sounds so amazing! Yeah, this one is *bursting* with flavour – so I agree you have to make it!!! So glad you loved it, Sophie!! !